International prices of most agricultural commodities have increased in recent months, some sharply. The FAO Food Price index has gained 34 points since the previous Food Outlook report in June, averaging 197 points in October, only 16 points short from its peak in June 2008. The upward movements of prices were connected with several factors, the most important of which were a worsening of the outlook for crops in key producing countries, which is likely to require large draw downs of stocks and result in tighter global supply and demand balances in 2010/11. Another leading factor has been the weakening of the United States Dollar (US Dollar) from mid-September, which continues to sustain the prices of nearly all agricultural and non-agricultural traded commodities. 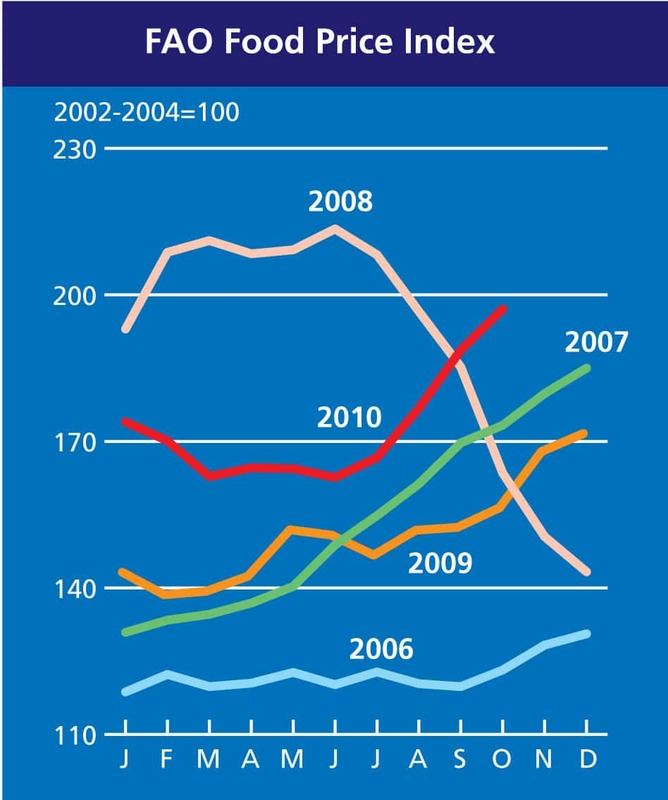 The increase in international prices of food commodities, all of which accruing in the second half of 2010, is boosting the overall food import bill in 2010 closer to the peak reached in 2008. The pressure on prices to rise was first felt in the cereal market, most notably for wheat and barley, in August. This prompted FAO to call for an extraordinary meeting on 24 September 2010 to discuss the underlying causes and possible remedies. The meeting clearly identified the importance of reliable and up-to-date information on crop supply and demand to cope with unexpected developments in world markets. More transparency and a better understanding of the role of commodity futures markets and government responses were also viewed as necessary to address price volatility. The full report of the meeting is included in the Special Feature section of this issue of Food Outlook. Amid fears of a repeat of the price surge experienced in 2008, FAO expects supplies of major food crops in 2010/11 to be more adequate than two years ago, mainly because of much larger reserves. The fact that supplies of rice, wheat and white maize, the most important staple food crops in many vulnerable countries, are also more ample lessens the risk of a repeat of the 2007/08 crisis in the current season. Nonetheless, following a series of unexpected downward revisions to crop forecasts in several major producing countries, world prices have risen alarmingly and at a much faster pace than in 2007/08. Attention is now turning to plantings for the next (2011/12) marketing season. Given the expectation of falling global inventories, the size of next year’s crops will be critical in setting the tone for stability in international markets. For major cereals, production must expand substantially to meet utilization and to reconstitute world reserves and farmers are likely to respond to the prevailing strong prices by expanding plantings. Cereals, however, may not be the only crops farmers will be trying to produce more of, as rising prices have also made other commodities attractive to grow, from soybeans to sugar and cotton. This could limit individual crop production responses to levels that would be insufficient to alleviate market tightness. Against this backdrop, consumers may have little choice but to pay higher prices for their food. 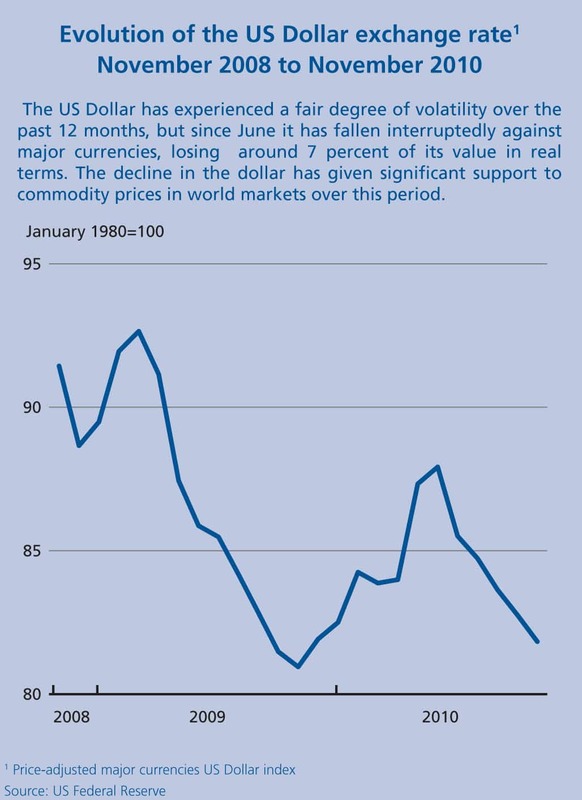 With the pressure on world prices of most commodities not abating, the international community must remain vigilant against further supply shocks in 2011 and be prepared. At USD 1.026 trillion, the forecast cost of importing foodstuffs at the global level in 2010 would be some USD 133 billion or 15 percent more than in 2009, and only a fraction short of the landmark USD 1.031 trillion reached in 2008. 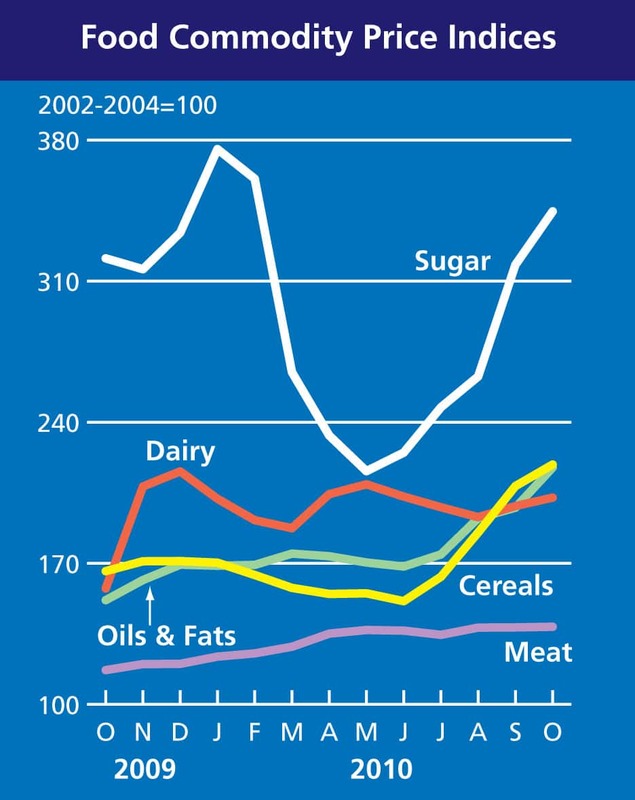 Under a new methodology, which re-categorizes products in concordance with international trade classifications, global food import bills in 2010 are strongly characterized by sharply rising expenditures on products other than cereals and stable cereal costs, confirming the trend that emerged in the June report. On the back of sustained economic recovery and rising freight costs, particularly in the latter half of the year, non-cereals are expected to account for almost all the annual growth in global food bills, with values foreseen to surpass the record levels registered in 2008. The cost of imported livestock products, especially dairy, is expected to increase by almost USD 50 billion, under the combined effect of higher import volumes and prices. The composition of the imported food basket, by and large, mirrors a return to economic growth in many countries, with large increases expected for the high-value products. In particular, expenditures on vegetables and fruits could climb by USD 25 billion to USD 191 billion, firmly establishing this product group as the most expensive in the globally traded food basket. Strong gains are also anticipated for vegetable oils and for fish products. In spite of soaring sugar quotations since mid-2010, the annual rise in the global sugar bill could be limited to around 8 percent owing to a foreseen contraction in trade. In contrast, the world cereal import bill in 2010 is expected to remain virtually unchanged from the previous year’s level. Compared with 2009, a reduction in wheat traded volume and in rice quotations could offset the impact of higher prices of wheat and coarse grains on global cereal trade value. The recent turmoil in grain markets is not expected to dent the overall benefit of relatively stable expenditures on imported cereals in 2010. The cost of purchasing food on the international market place for the most economically vulnerable groups is also set to increase in 2010. LDCs expenditures could register an 11 percent rise, but at 20 percent, the foreseen rise in Low-Income Food Deficit Countries (LIFDCs) bills would be the highest of all economic groups, far exceeding the increase at the global level. Putting this in a broader perspective, foodstuffs could account for roughly 17 percent of all expenditures on imports of vulnerable countries, compared with a world average of only 7 percent. Much respite for them could come by way of a considerable fall in the cost of importing cereals on account of robust domestic production prospects, but much higher expenditures on other foods easily counteract these gains. With 2010 drawing to a close, attention is now on prospects for next year. Sharp increases in international quotations for grains, sugar and products in the oilseed complex in recent months are already a cause for concern. It is unlikely that the effects of higher prices will be contained within their respective sectors, as many of these commodities constitute major feedstock ingredients for the livestock or biofuel sectors. With price increases largely reflecting scarcity in export supply, global competition for securing foodstuffs is set to intensify. FAO’s Food Outlook (November 2010) is available at <www.fao.org/docrep/013/al969e/al969e00.pdf>.